The Herstory Project is a stirring kaleidoscope of exemplary women from different backgrounds, temperaments, passions, and achievements. The stories of these women challenge and move beyond long-held traditions of gender discrimination and cultural inhibitions to reveal individuals whose determination and self-belief have had tremendous impact on their livelihoods, communities and nations. 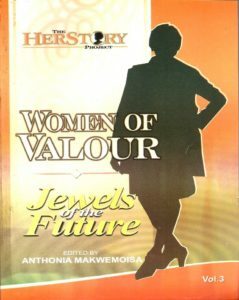 These narratives redefine and delineate the contours of women empowerment and leadership in African communities, broadening the discourse to include the transformative power of the individual and her society. May University Press Limited (RC: 969936) is an educational and heritage research and publishing organisation registered in Nigeria as a limited liability company. 16B, CMD Road, Magodo Lagos, Nigeria.